It was only last month that we got our first taste of NVIDIA's Optimus Technology, courtesy of the ASUS UL50Vf. We were without doubt impressed, but there was a small issue with the test platform… or perhaps a not-so-small issue. The UL50Vf uses a CULV processor with G210M graphics—nothing spectacular in performance, but good enough for a reasonable system that can last upwards of 10 hours on a single charge. The problem is that the UL50Vf is a 15.6" notebook, and while it's not as bulky as other 15.6" offerings we have to admit that the pairing of CULV and Optimus cries out for a smaller chassis. Today, we're reviewing our second Optimus notebook, but while the chassis isn't any smaller—in fact, it's slightly larger with a 16.0" LCD—the other changes make this a much better platform. We're going to cut straight to the chase and hit the spec sheet. Gone is Core 2 CULV, replaced by a much, much more powerful i5-430M processor. Sure, CULV overclocked to 1.73GHz provides reasonable performance (as with the ASUS UL series using the Turbo33 feature, or Alienware's M11x), but switch to Arrandale, bump the clock speed up to 2.26GHz (2.53GHz with Turbo Boost) and add Hyper-Threading and there's simply no competition. We'll see this later when we get to the benchmarks. The CPU isn't the only upgrade, however; ASUS pairs the faster CPU with a significantly faster GPU, the GeForce GT325M. Now, the G210M is a much faster GPU than any IGP. We measured gaming performance that's at least 40% faster than the 9400M, and as much as 100% faster; average performance is about 60% faster than the 9400M. And to put things in perspective, the 9400M is currently the fastest IGP solution, coming in anywhere from 10% to 90% faster than the HD 3200 in our testing (average is about 25% faster in games); the HD 4200 is only a slightly faster clocked version, trading blows with Intel's new HD Graphics but not beating the 9400M. Where does the GT325M rank? It has 48SPs compared to 16SPs on the 9400M; core clocks are about the same as the 9400M, which means it has almost three times the Shader/GPU processing power. It also has 1GB of dedicated GDDR3-1400 (at least in the N61J) and a 128-bit bus, giving it a dedicated 22.4GB/s; IGP solutions have to get by with sharing half as much memory bandwidth with the CPU and the rest of the system. What we're looking at then is performance that should be more than twice as fast in most games (assuming the game is GPU limited). And of course, Optimus Technology means that the GPU can turn off completely when it's not needed, so you can get maximum battery life from the Intel IGP when you're mobile. Other changes relative to the UL50Vf aren't quite as significant, but they do help performance. ASUS ships the test model with a 500GB 7200RPM hard drive; our system uses a drive that Seagate touts as using "only .05% more power than a 5400RPM drive". We're not sure what 5400RPM drive they're comparing the 7200.4 Momentus with, but it's definitely faster than 5400RPM drives so we're happy to lose a bit of battery life if it means snappier performance, considering the other component choices. Speaking of battery life, the above upgrades do not do the N61J any favors when compared with CULV offerings. ASUS provides a 48Wh 6-cell battery with the N61J, and the combination of a smaller battery and a more power hungry CPU+IGP means you're looking at around 4 hours of battery life best-case scenario. Obviously this isn't meant to be an all-day mobile solution, and when we look at all of the specs together 3-4 hours of battery life for typical tasks is quite good. This system can function quite well as a desktop replacement, provided you're not trying to run workstation type applications. We do wish ASUS was able to cram in a larger 65 or 84Wh battery like the UL series, but we understand the need to keep BOM costs in check. The particular variant of the N61J that we're reviewing is the N61Jv-X2. If you're not familiar with the ASUS nomenclature, the "X" following the main model name indicates a specific build for a major reseller, in this case Amazon. Other variants of the N61J will feature i3-330M, i5-520M, or i5-540M processors; differing HDD capacities and RPMs; and Blu-ray support on some models. We'd love to see the N61Jv with a Blu-ray combo drive, but before we go Blu-ray we'd like to see a better LCD—1080p in a 16" LCD is a perfect fit for Blu-ray in our book. Such upgrades would naturally have a significant impact on the pricing, so taken as a whole the X2 model is equipped very well. It's currently available (and in and out of stock) at Amazon for $899. $900 is a major price point target with competition from every major manufacturer. We've recently looked at the Dell Inspiron 1564, which is going to be a focus for our performance and value comparisons. 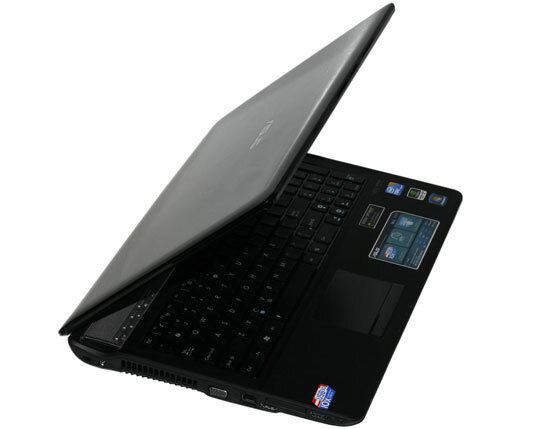 We've got reviews of other vendors in the works as well, including a Lenovo ThinkPad T410 and the Acer Aspire 5740G. What sets the ASUS apart from the competition, beyond NVIDIA's Optimus Technology, is the overall package. The warranty is a great example: ASUS provides a standard 1-year global warranty with accidental damage protection (one incident only and one-way shipment for accidental damage), two-way shipping for the customer, and a 30-day zero bright dot guarantee on the LCD. Would we prefer a 2-year warranty? Sure, but every little extra bumps up the price—Amazon does offer a 3-year warranty with the N61Jv for $1030 if that's important to you. Rounding out the package are the usual extras, plus a few noteworthy additions. ASUS provides HDMI and VGA outputs, Gigabit Ethernet, 802.11n wireless, a flash memory reader, and an ExpressCard/34 slot. In addition, ASUS provides a single eSATA port and two USB 2.0 ports. The big extra is that ASUS has added an NEC USB 3.0 controller for one more USB port on the left side. We unfortunately didn't get the necessary hardware to test the USB3 performance, but ASUS' internal testing with a USB3 hard drive enclosure shows transfer rates over three times faster than USB2; at that point, they run into a conventional HDD performance bottleneck. USB 3.0 support is in its infancy, but the inclusion of the feature on the N61Jv makes it a forward-thinking design and we're sure users will be happy to have that extra down the road. About the only area where ASUS cut any corners is the LCD; it's yet another low contrast 1366x768 model—not the end of the world, but nothing to brag about either. It is about time you people at Anandtech implemented a black list for your comments section don't you think ? I hear ya, and I'm probably one of the guys that deletes most of the posts. Thankfully we have an option to "delete all posts" by a user, but right now there's no quick way to ban a user as well. I'm hopeful we'll get that with the updated site in the next month or so. 1) full size arrow keys, used far more than "0"
2) rt. Ctl key extends under the rt. Shift -- enabling selection by word or paragraph with just the right hand. Right index finger can hold down both, while other fingers hit the arrow keys. Great for editing. Having played with both, I find the Acer keyboard slightly more to my style. The smaller arrow keys don't bother me at all, as they're still big enough. Also, the smaller size helps set them apart from the other keys; notice how they're all in a perfect grid on the ASUS? For the CTRL+Shift, I almost always use my left hand for those keys, and I also use two fingers to hold down two keys. If I'm using CTRL and/or Shift + Arrow / End / PgUp / etc., all of the directional keys are on the right side so there's no way to comfortably hold CTRL+Shift+End with your right hand anyway (unless you have Gumby fingers).